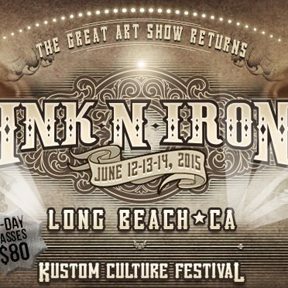 Aaron Bell, Clark Kent, Daniel Charneski, and Elijah Cole will be tattooing and selling prints, books and artwork at Ink n Iron June 12-14th. We still have bookings available. There are many great bands in the line up here including: Pennywise, Wanda Jackson, UK Subs, The Dickies, The Adolescents, Peter Murphy, Gary Numan and Fishbone just to name a few. This show is always a hoot! Well worth the trip to sunny California. For booking contact the shop.